I tried to live with a high-end feature phone. I can't. The world's biggest mobile tech show has just finished. You were probably poring over all those new big-screened smartphones, but you still remember what came before those all-screen oblongs, right? When was the last time you saw a flip phone being used? Not a Nokia clamshell buried away in a drawer, or a Motorola RAZR dusted off by an older relative who charges it once a month, but in a train station, at a bar -- in public. For me, it was a few hours ago. I live in Japan (Hi! ), and people here still carry a torch for the feature phone -- or at least, their version of it, the gara-kei, short for Galapagos keitai. ("Galapagos" refers to Japan's curious tech ecosystem that gave birth to devices that only seemed to appeal to its home country. Oh, and keitai means phone.) Last year, shipments of feature phones increased, while smartphone figures fell. Experts said this was more a one-last-hurrah boom than a new trend, but still, over 10 million of these simpler phones shipped in 2014. How are these phones clinging on in the face of obviously superior hardware and functionality? And who's still buying them? 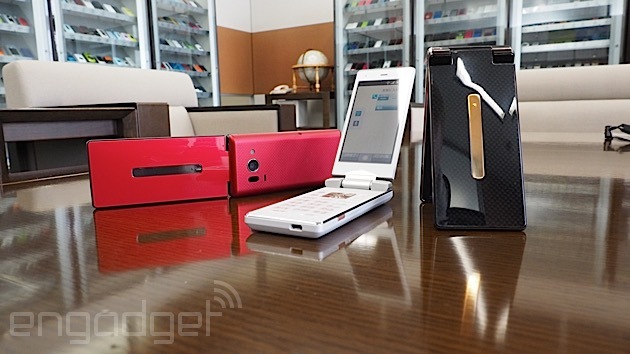 KDDI, one of the three major mobile carriers in Japan, continues to sell enough Galapagos phones that it warranted teaming up with Sharp to create the AQUOS K -- a top-end flip phone with LTE, a quad-core processor and a touch panel; it's even capable of running applications, including Japan's dominant messaging app, Line. (This is very important.) 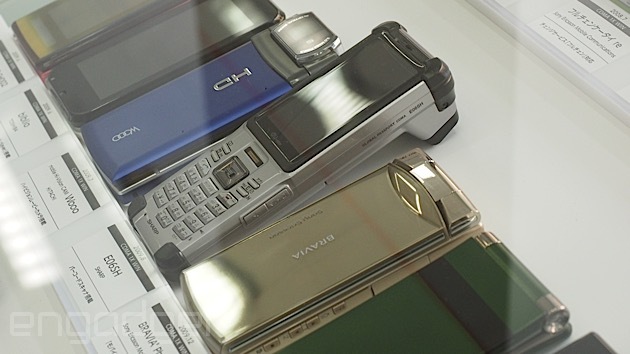 However, it still looks a lot like the hundreds of flip phones that have lined the shelves of Japanese phone shops for years. "Typically the apps we've focused on are ones that the customers are already using," the spokesman added. So there are weather, news and puzzle apps -- but it's not a smartphone-like selection. 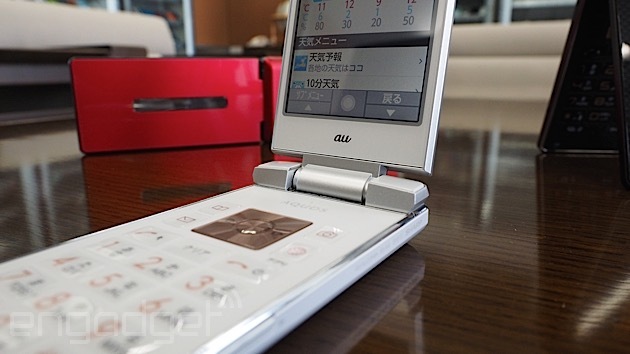 "If a customer wants to [use] a large selection of apps ... we'd advise a smartphone over the AQUOS K. A lot of customers love their flip phones -- the keitai is tied to [the] culture of Japan." There's even such a person in my office. Meet Ouki Chiba. He loves his feature phone. The Japanese editor-in-chief of our sister site Autoblog JP was eventually browbeaten by coworkers (and this guy) into buying an iPhone, but his eyes light up when we ask him about the gara-kei thing. Why do you love these phones? "It's light," he says. "It's small; it's easy to type on, easy to talk into." He then flips one open, adding, "It's cool." He flips it shut. What has he gained from the upgrade to a smartphone? He's silent: He doesn't use the map app, and says the camera on his flip phone was good enough. I'm at a loss for words. Would he go back to a feature phone? "I just bought this thing," he says as heaves the iPhone 6 up, "but maybe." Feature-phone users still want certain features to be offered on smartphones: infrared transmitters for sharing phone numbers and contact details, keeping the "easy to type" buttons. This also extends to things that are pretty confusing to anyone who's used a smartphone for years (like me). There's an array of menu buttons above the keypad that act as navigation keys, shortcuts and confirmation buttons. These are apparently what the company's research suggests customers want. According to KDDI: "We want to transfer the way people used their beloved phone, but add some modern benefits from smartphones." There's also another benefit that I wasn't aware of: A lot of feature-phone users became such capable typists (and most of these phones stick to the numerical keyboard layout) that they can hammer away at emails and text messages on feel alone. The physical feedback is more than enough -- something that smartphones (even with haptic feedback) can't offer, at least not yet. Unlike prior feature phones, there's also 4G this time around. Gara-kei typically came with last-generation networks; they didn't need high-speed data. However, the network is limited as to what it can access, which leads to another reason why feature phones hang on: They don't use much data, so they're cheap -- or at least cheaper than smartphones. If businesses or older users who aren't dead-set on having apps or the expanded capabilities of smartphones -- if they see a phone that's substantially cheaper -- it's another reason to buy that new flip phone. And there's been no shortage of options over the last decade. In KDDI's HQ, the company houses most (but not all) of the phones it's sold over the last two decades. According to the display, in 2008, it fielded 24 different phone models. Many had unusual designs and often unique (read: borderline ridiculous) hardware features. One model packs a department-store-like barcode scanner, while another phone is plated in a solar panel to recharge itself. The keitai (mobile phone) is tied to the culture of Japan. Another phone, from Sony Ericsson, had an (at the time?) "innovative" hinge that let the phone swing open both vertically and horizontally, for TV viewing and old-fashioned, on-the-phone talking. Despite the low technical specifications in comparison to smartphones, many of these phones were, even a decade ago, able to pick up TV broadcasts from all the major channels through the country's One-Seg TV signal. Who needs YouTube? If you're asking older phone users, still enraptured with their feature phone -- they probably don't. These phones had (and often still have) features that your smartphone doesn't. Do you need these features? Maybe not. But that's not to say else someone doesn't. There's also the sheer, downright ruggedness of a feature phone: You're unlikely to crack the screen on a Japanese feature phone because it's both small and, usually, flipped away. And for all the benefits of the smartphone, there's one benchmark where it's bested by the feature phone: battery life. Sure, you're probably doing less with a flip phone, but from our unscientific survey of people we spotted using flip phones, that predictable, lengthy battery life was another reason many Japanese weren't looking to move on to a smartphone. It's pretty hard to get a stranger to talk about their feature phone, but one "salaryman" said he gave up on his iPhone, returning to his feature phone because he just didn't trust the phone's battery to last through the day. For him, he just wanted to make phone calls and send text messages -- things that his gara-kei can certainly do. He can survive without an app store, LTE or a touchscreen. Even if we can't.